about their recent album, Steady as She Goes, and its themes. I wanted to know how the band started life and whether they share similar tastes; what Berlin, their base, is like in terms of influence and creative drive – they recommend rising artists to watch. I discover what they have coming up and if they each have favourite albums; whether there are any gigs coming up and how they relax outside of music – the and choose a song to end the interview with. Hey! It’s been an exciting week. We’ve been making a lot of plans and creative decisions. So, yeah, quite a good week altogether! (Smiles). We’re Holler my Dear; an international six-piece from Berlin. We have been described as “Music as antidepressant” (Die Bühne); we call it ‘Disco-Folk’. We are a passionate live band: for us, nothing is better than a sweaty burst of energy while playing one’s heart out. 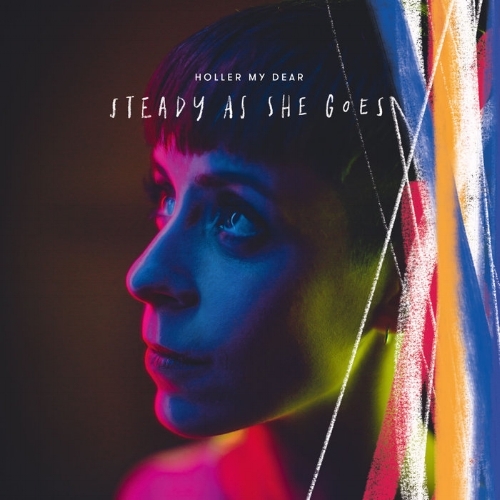 Steady as She Goes is your latest album. What sort of themes and ideas inspired it? It’s a political album that signalises confidence, courage and movement. When the shadows in the world grow longer, lamenting doesn’t help but optimistic determination does. No fear. Seeming contradictions are also where the album’s nautical title stems from: Steady as She Goes, a term for 'keeping the ship on course', is less about going in straight lines and more about navigating high tides: finding consistency in fluctuation. Change is part of our life and we are in perpetual motion. How did Holler my Dear get together? When did you start playing together? It felt like a blind date when we met for our first session in 2011. Fabian was the first musician I got to know in Berlin and I literally found the others via a combination of recommendation and coincidence. I had a sound in mind and was very lucky that it came off right away and kept going ever since. Our musical tastes are as super-diverse as our musical backgrounds: from Hip-Hop to Turbo-Folk; Neo-Soul to Ambient. This contrast keeps us going. We inspire each other. Is Berlin a great home? What is it like to create there? Oh, yes! We love Berlin! Although gentrification has kicked in massively in the last couple of years, we still feel and love the city’s unique spirit and sense of freedom and space. It seems to attract libertines of all kinds from all across the world. There are so many talented people out there! We find Berlin’s vibrant art scene seriously inspiring. We’re about to launch our very first crowdfunding campaign to realise a massive concert at Lido in Berlin next April under the title The More the Merrier (named after a soulful ditty from our latest album). With the help of our fans, we will be putting on a spectacle featuring various special guests, circus performers; a light-show and our very own recipe Holler drink...super-exciting! Playing an open-air festival in Mexico City in 2016 for 9,000 pogoing music-lovers was an experience beyond words – pure love! It switched me on to Rap, showed me that music can have a message, be funky AND angry at the same time and still ecstatically enjoyable...and encouraged my small rebellion and shift toward the counter culture that I hold dear to this day. This album inspired me to study music. It felt as if somebody was singing directly into my ear and was reading my teenage mind (“When my anger starts to cry”). Its intensity completely blew my mind and changed my way of thinking about Rock music fundamentally. Melodies, philosophical lyrics and, of course, Gilmour’s guitar solos. Because it was something completely different than Bach. And, finally, loud. Well. You know we are foodies, so...catering! Never-ending catering! Never-ending, delicious catering! Keep going. We strongly believe in langer atem (literally ‘long breathing’; meaning being in it for the long haul and persevering) #forward. Have we already mentioned our crowdfunding campaign? (Winks). If the campaigns goes well, we shall Holler in Lido (Berlin) on 04/04/2019. We’re lucky to be surrounded by inspirational creative colleagues such as: Ben Barritt, Yazzkimo; Kwena, Kid Be Kid; Tanga Elektra, Jim Kroft; Oko, Zinq; Komfortrauschen, Maria Christina/Federico Casagrande DuoJacky Bastek; Schmieds Puls, Skazka Orchestra; Alright Gandhi, Yusuf Sahili; Teresa Bergman, Friede Merz; Leni & The Boys, Meetin’ Moa; Fräulein Hona, Listen to Leena and many, many more! Nature, food; books, travelling; dancing, meditation; having deep talks and silly laughs with friends and lovers.